The Business Services Division of the Nebraska Secretary of State files and registers Corporation, Limited Liability Companies, Limited Partnerships, Limited Companies, Limited Liability Partnership, Foreign Entities and Nonprofit Corporations. The records of the filing and registrations are recorded in the business corporation registry and are available for public access on certain conditions. 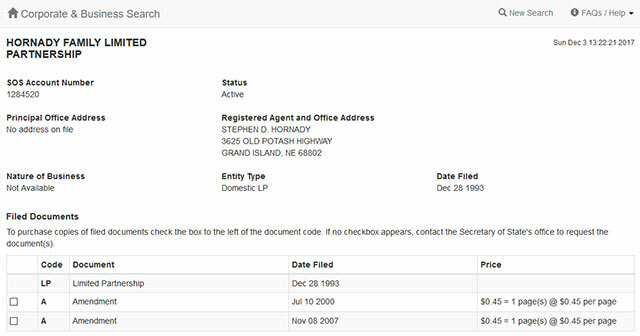 The registry also records information on trademarks and trade names administered by the Business Services Division of the Nebraska SOS. 1. 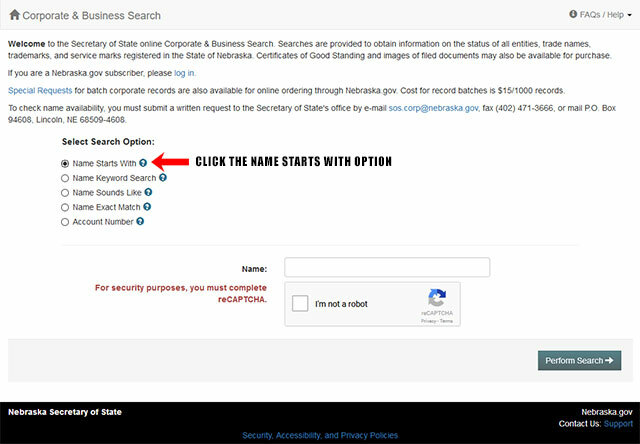 The first step is to access the Nebraska business search page by clicking here. You will arrive at a page which looks something like the screenshot below. 2. This page allows you to select a search option. The options are Name Starts With, Name Keyword Search, Name Sounds Like, Name Exact Match and Account Number. For this example click on the "Name Starts With" option. When clicking this option a form field will appear below it, as seen in the screenshot below. 3. For this example go ahead and type in the name "Hornady" in the "Name" field. 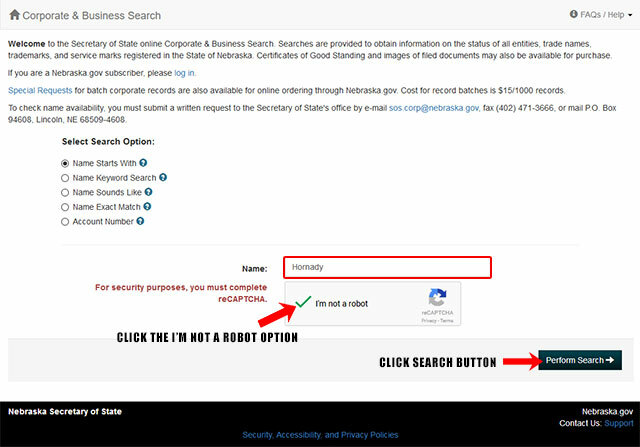 For security purposes click the "I'm not a robot" checkbox to verify you are human. From there click the "Perform Search" button. Refer to the screenshot below. 4. Once you click the "Perform Search" button, the result page will display a list of entity names along with their account number, type and status. Refer to the screenshot shown below. 5. When you click the "Details" button, it will show the business entities details as shown in the screenshot below. 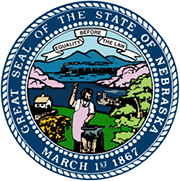 The Secretary of State of Nebraska is a constitutionally appointed office in the state of Nebraska in US. The office is one of the executive branches of the state government. The current Secretary of State of Nebraska is John A. Gale. The term of the office is for four years and the vacancies are appointed by the Governor himself. The Secretary of Stare of Nebraska acts as the chief advisor of the state on civic education for the youth. He is also the custodian of the Great Seal of Nebraska and is also responsible for certifying and authorizing public documents. He is also the chief protocol officer in the state and is in charge of promoting commerce, cultural exchange and education between the state and the foreign nations.